I fitted a Halyard Marine Aquadrive coupling in around 2002, since when it has performed faultlessly with virtually no maintenance. The model I fitted was the 20000, now superseded by the Moduline. My main intention in fitting the coupling was to prevent contact between the shaft and stern tube after re-engining with a Yanmar 3GM that had far softer mountings than the Bukh 20 it replaced. As advertised, it has also contributed to reduced sound levels within the boat. There are some critical measurements associated with fitting an Aquadrive. The first of these is the length of the unit in its static condition. This is well explained in the information that accompanies the device, or can be downloaded from here . 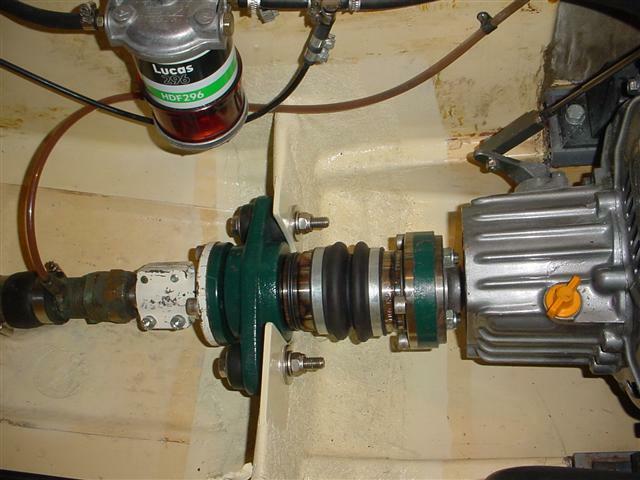 Further useful information about the installation is given at this site The other critical measurement is that the drive shaft has to be central within the stern tube. 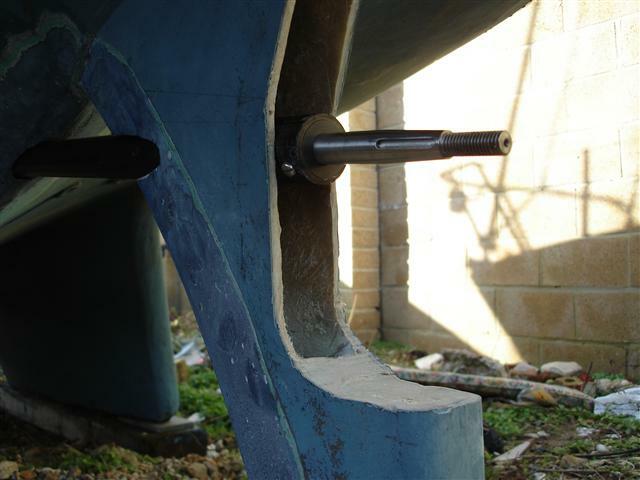 Once the thrust plate has been installed into the boat it is impossible to correct this without major modification. 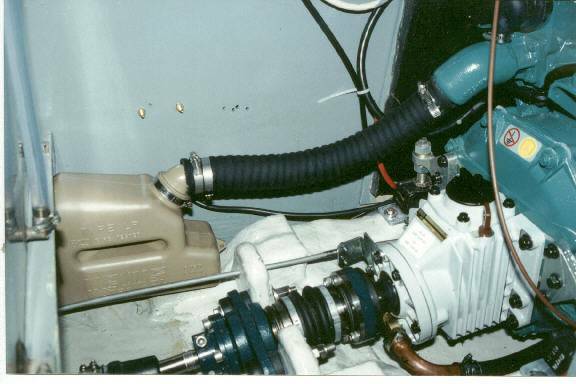 My first moves were to remove the propeller, disconnect the drive shaft from the gearbox and remove its coupling flange, as it did not match the output flange of the Aquadrive. This can be a difficult job to accomplish in a cramped space but several methods are described in the Couplings page of this site. Next I assembled the Aquadrive unit and attached it loosely to the gearbox flange to gain some idea of where it would sit in service. Setting it up at the required length is a little tricky as the rubber gaiters push it open. I tied the flanges together at the required overall length with a length of line. I then pressed the new coupling flange onto the shaft and assembled the whole train into roughly its final position using clamps, blocks of wood, etc. At this stage the shaft was still far too long but this does not matter. I then began to mock up the thrust plate, initially in strong cardboard. 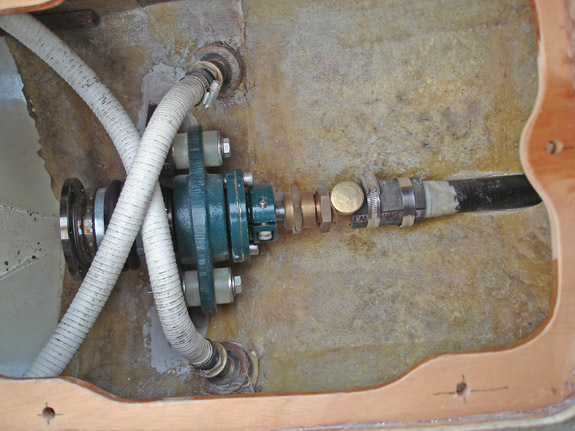 This had to be a good fit to the internal surface of the bilge, have all holes and cut-outs in the right places for the Aquadrive and be at the correct height to ensure that the shaft lay centrally in the stern tube. This took several attempts to get right but finally I was reasonably satisfied. I then used the cardboard as a template to make a final pattern in plywood. I made this up as accurately as possible and assembled the Aquadrive onto it, tightening flange and mounting bolts to ensure final positions. Some more shaping was required to get everything as snug as possible. 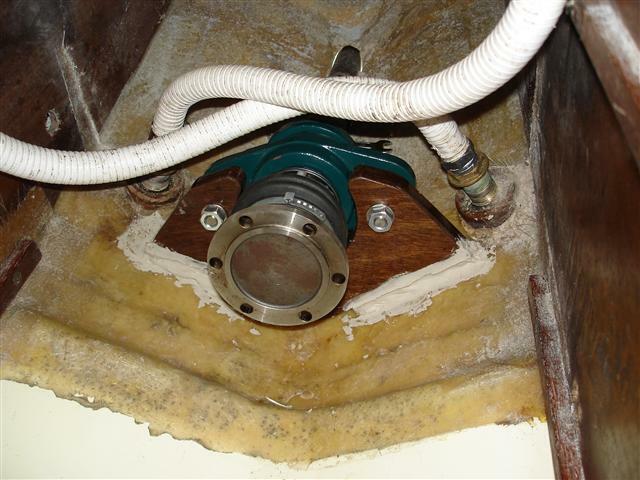 One final action was to cut a semi-circular drain hole at the lowest point to allow any water in the stern locker to get to the bilge. Finally I took the wooden pattern to a local metal shop, where an accurate copy was made in 5 mm steel. I then drilled a few additional 6 mm holes at the edges to help with the bonding of the epoxy layup. The photo shows the thrust plate assembled into position for final checking. Despite all the previous work some further shaping was still required, most notably to give further clearance between the plate and the bearing housing of the Aquadrive. By this time I had thoroughly cleaned the area of the bilge where it would sit and abraded the surface of the GRP for a few inches all around. 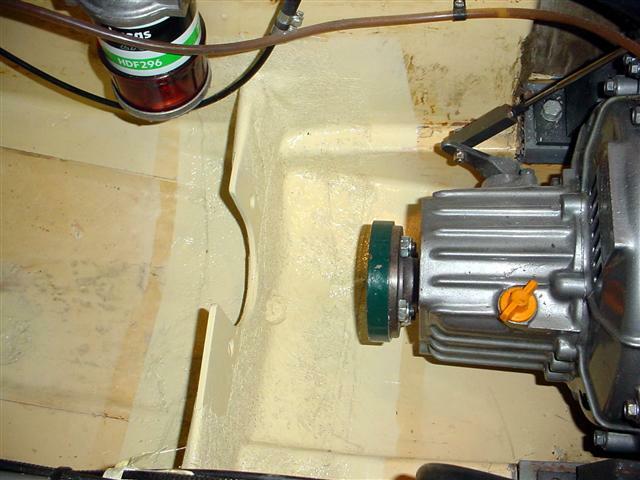 With the Aquadrive assembled and bolted up I mixed epoxy and filler to a heavy paste and applied it to the plate and bilge to make a fillet between them. After allowing this to cure overnight I was able to remove all the coupling components and start lay up. West epoxy, chopped glass mat and woven rovings were used to build up a heavy and strong support for the plate. 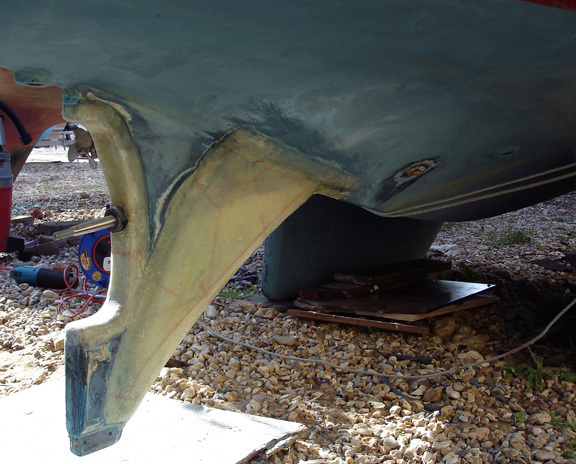 Finally the plate and layup were spray painted using automotive aerosol paint to match the bilge. To finish the job I was able to assemble everything in its final configuration, measure the length of shaft to be cut off to accommodate the new length, refit the stern gland and propeller, and the job was finished. 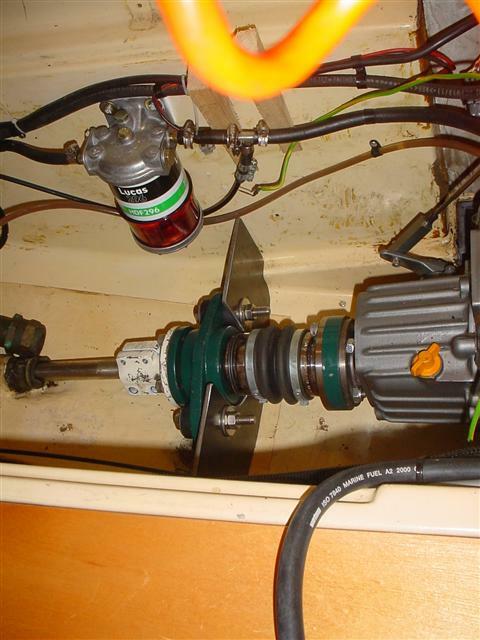 An Aquadrive coupling fitted to a Volvo MD2030 engine on a Westerly Fulmar. A Volvo shaft seal is used and can be seen lower left. In this case the thrust plate is made of timber.